Each EPS amber IV bag cover fits IV solution bags of 50 mL/250 mL, or 500 mL/1000 mL. 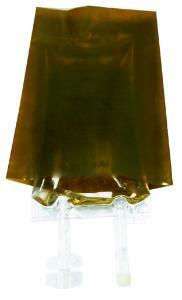 Amber IV bag covers are used in hospitals to help reduce potentially harmful light effects in IV drug delivery. Add this to your curriculum for a perfect IV administration simulation for your nursing, pharmacy, EMT or other allied health skill laboratories.